The company ISS is sub-contracted by East Coast rail to employ cleaners and tankers, who clean and fill the trains water tanks. The cleaners and tankers are on strike. They are asking for a wage increase and a contract that guarantees their wages. 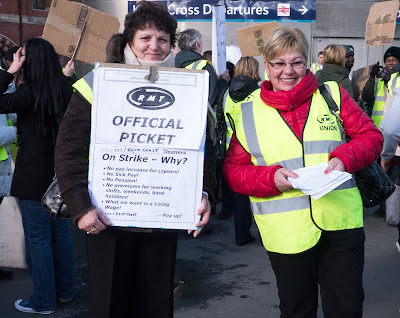 At present ISS pays them £6.19 per hour. (the legal minimum wage for an adult). The workers say they often are short paid or not even paid at all. They also say to live in London you need £8.30 per hour. I guess I will be travelling in a dirty train today. I do hope there is a resolution very soon. £6'19 in London? The Tory Party in power! Hope they get what they want. I hope they succeed in their efforts. I can't wait to see where you are off to on your messy train. They'd probably get more than that on benefits, shocking. It's not even a very nice job to do for that pittance. I hope they get what they're asking for!